A double elimination tournament where all matches are best-of-three. Every player has two lives and must lose twice to be eliminated. After watching the reflection in my GCS Season 1 trophy for 5 hours now I know what must be done. Good luck and have fun to everybody involved. Thank you to all the people working on this project and I wish all the contenders best of luck in the tournament. See you on the battlefield! As long as I don't get Ferma I should be good. Brackets Poster to print and use. Double elimination is a modern staple in computer game tournaments - including Starcraft, DotA2, LoL, and CS:GO. The concept relies on the idea that every player must lose two matches to be eliminated. 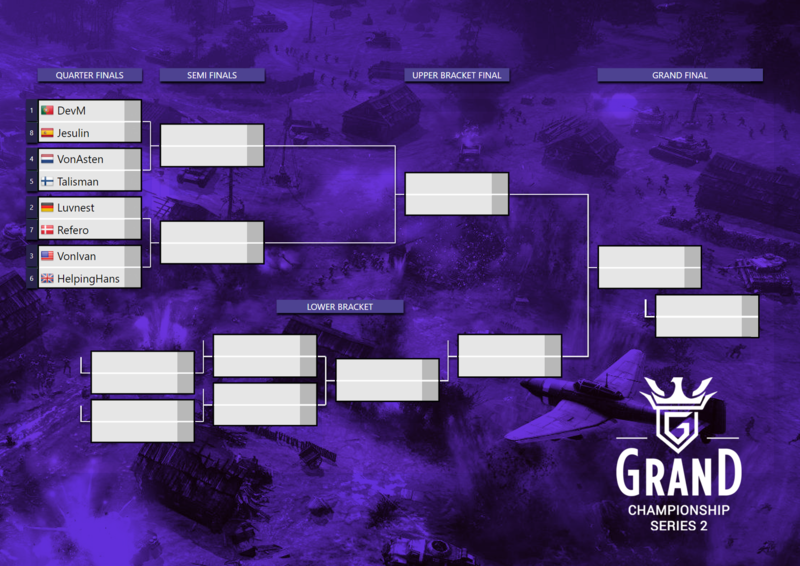 In the Grand Final this extends to the player the upper bracket who is yet unbeaten. If they are beaten once it opens up a second match in the grand final. This format ensures no flukes, and also gives players that are flying across the world a second chance to prove themselves.